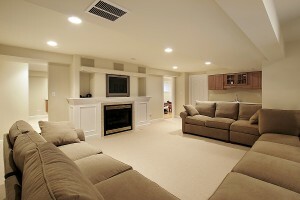 Why should you remodel your basement? It can take a great deal of time as well as a large sum of money, but it can benefit you greatly in the long run. By adding another usable room, you allow more space for your household, perhaps filled with equipment good for health, entertainment, or creativity. Furthermore, that extra accessible space can increase the sale value for your house, since a finished basement is more appealing than an unfinished one. Then what, you may wonder, should you do with your redesign? There are multiple rooms that could come from a basement remodeling project, so it’s a good idea to ask yourself what would be best suited for your household. If you want to be in better shape, you could create a fitness room. If you have young kids who need somewhere to get their energy out, a play room could be ideal. If you need a better space for guests, an entertainment room with a large TV or a pool table could be fun for all visitors. Depending on what exactly you want to do with your basement, it may require a specific type of flooring, lighting, and furniture, to name a few design considerations. It is also highly dependent on how much would need replaced or changed, so make sure to have a good idea of what you already have and what you would like. Then, call a home improvement company and explain your basement remodeling plan. They can give you a good idea of what exactly is possible, how much it may cost, and how beneficial it may be to you in the end.